When I was in the grocery store last time, chicken breasts were on sale, so I grabbed a bulk pack. I will be able to make at least 2 chicken meals from this so I’ve scoured Annette’s cookbooks for a suitable chicken dish. 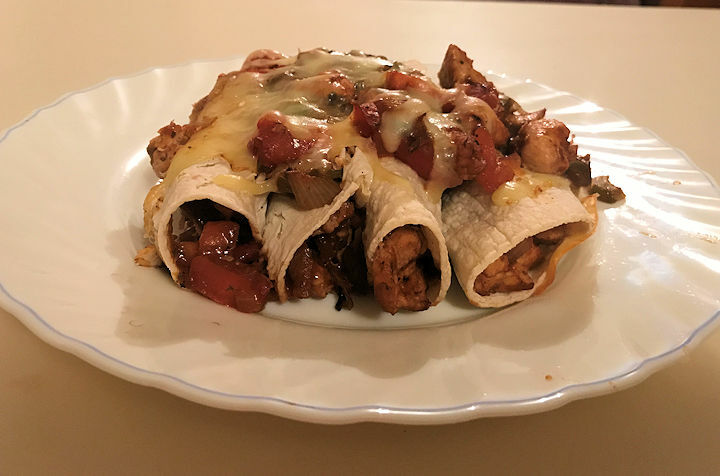 The Chicken Enchiladas in Symply Too Good To Be True Book 5 looked good (hubby and I both love Mexican meals) and I thought they would be a great fit for a Friday night. This will be my second recipe from the personal recipe book challenge I have set myself. I like to have all of my prep ready to go ahead of time so I’m not running about chopping frantically on one counter while trying not to burn something in another area. 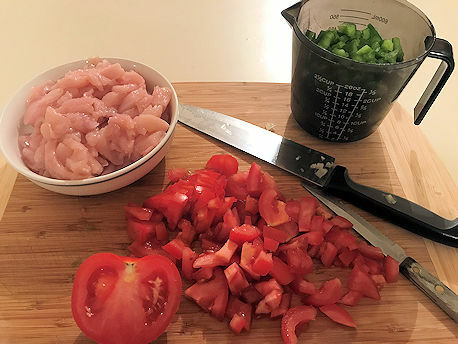 I sliced up the chicken breasts first and then diced the onion, capsicum and tomatoes before I got started. Now I feel ready to start. I have to tell you, it feels good to look upon a counter of fresh produce ready to be cooked up. Too many nights lately, I’ve resort to canned soup or we’ve ordered takeaway. I pulled out my old electric wok for this one. 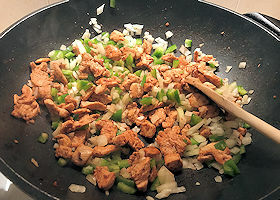 Saute the garlic and chicken. This takes about 5 minutes. Then you want to toss in the onion and capsicum and cook for another few minutes. Once that looks done, just about everything else goes in aswell. Add the tomatoes, a jar of salsa (recipe calls for spicy bean but I was unable to find this…. 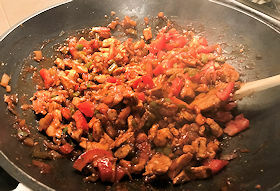 I ended up using Aldi’s Medium salsa), chicken stock powder, water, cumin, dried coriander and chilli powder to taste. By this stage, it’s smelling pretty good and it looks fantastic. 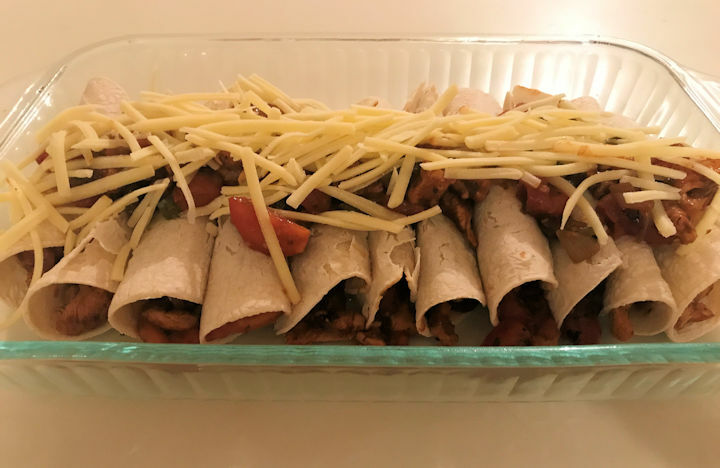 I microwaved the corn tortilla wraps per the packet directions to soften them up and started rolling them around the yummy filling. The idea here is to spray a baking tray and then line them up with a little tasty cheese on top. I had extra filling so I drizzled this over the wraps aswell and then chopped up an additional tomato to lay on top for added ‘sauce’. Here they are ready to go into the oven for around 20 minutes. And here it is ready to be devoured….. and devoured it was! So yummy! The book says this serves 6 so I’m almost a little embarrassed to say it served just hubby and myself. I had 2 helpings and he enjoyed the rest. I blame a combination of me having skipped out on lunch and this meal being so delicious! Definitely one I can add to the regular rotation, but not one my kids will eat – or even try. Sigh. It did have a bit of a kick to it (I opted for the chilli powder) but it wasn’t overwhelming at all. Hubby doesn’t like things too hot or spicy and he went back for additional helpings. Cost-wise, it worked out around $14 for the main ingredients. Compared to the pretty ordinary Chinese takeaway we’d get most Friday nights that sets us back around $40, I’d say this was an absolute bargain. You’d probably need to be in the mood to cook for this, even though it wasn’t difficult. It’s just probably not something you can mindlessly ‘toss together’. I’m toying with the idea of making the filling again and just freezing portions to take for work lunches with a couple of the corn tortillas. For me, it was a winner. I will definitely be making this one again. I’m not sure anything will outdo Annette’s Beef Torilla Stack, but this one came pretty close for me.